One-car garages can be attached or freestanding and offer enough space for one vehicle and often some additional storage. A 1-car garage plan is a great addition if you need to accommodate the vehicle of a grown child or in-law. Perhaps you already have an attached garage and just need some additional space, these plans are a great option and take up less yard space. 656 Sq. Ft., Width 24'-0", Depth 28'-0"
1028 Sq. Ft., Width 24'-0", Depth 36'-0"
196 Sq. Ft., Width 32'-0", Depth 24'-0"
672 Sq. Ft., Width 64'-0", Depth 48'-0"
811 Sq. Ft., Width 32'-0", Depth 24'-0"
273 Sq. Ft., Width 16'-0", Depth 40'-0"
273 Sq. 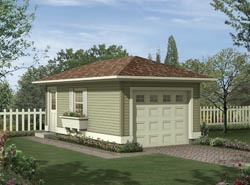 Ft., Width 40'-0", Depth 16'-0"
Our collection of project plans includes many 1-car garage plans in different styles and sizes perfect for all of your building needs. We offer detailed blueprints that allow the buyer to visualize the look of the entire finished project, right down to the smallest detail. With a wide variety of one-car plans to choose from, we are sure that you will find the perfect do-it-yourself project to fit your needs and lifestyle demands.